We’ve all been fed so many “old wives tales” over the years, especially when it comes to cats. Some are bizarrely superstitious, like black cats are bad luck, or even weirder, that they steal the breath away from newborn infants and babies. Or how about the “fact” that they have nine lives or always land on their feet. But one of the better known cat-associated tales is that they hate water. While it’s true many breeds of cats are not necessarily water-friendly, there are many that do enjoy going for a swim, especially in hot and arid living environments. For example, in the wild kingdom, you’ll often see tigers enjoying a swim, even preying on one of their favorite foods – fish. But on the other hand, lions and leopards will usually avoid rivers and streams to steer clear of some of the very few predators that pose a potential risk to them, like crocodiles. Since our more domesticated and docile kitties are considered distant descendants of these big cats, it wouldn’t be fair to say that ALL felines despise water or that cats shouldn’t be leary of H₂O as an instinctual trait. Let’s delve deeper into this dilemma and see what we find underneath these murky waters. Animal Planet tells us an irrational fear that some domesticated cats have about water may have come from their masters. Many humans that have been shielding them from the elements over the centuries since we have adopted them as our pets. We’ve been protecting them from heavy rainstorms and other exposure to these types of wet experiences, and so it’s believed they never accepted some of Mother Nature’s fury or learned to evolve in order to deal with it. Further water annoyance problems come from people who use water as a punishment for cats that may claw furniture or display other destructive behaviors and they squirt them with this liquid as a non-violent deterrent. Perhaps they were given a forced bathing experience or got caught outside during a torrential downpour when they were more accustomed to being a lap cat. Regardless of the nature of this exposure, they may have been dealt a raw deal when it comes to playing in the water. But cats, curious by nature, can wind up in desperate need of a bath and as their masters, we’re the ones laiden with this responsibility. Whether they wound up in a sticky situation or came in contact with a smelly critter like a skunk, we need to respond with appropriate cleanup measures that require soap and water. 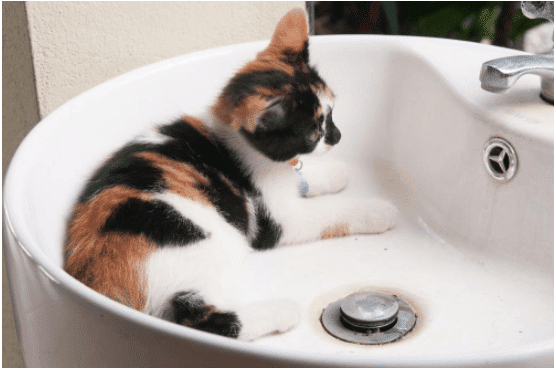 Despite some of them having an aversion to being completely immersed in water, many cats find that hypnotising “drip-drip-drip” of a faucet fascinating and some enjoy laying in empty, cool sinks during hotter months. Either way, cats still need water to survive, just like any other animal and are not necessarily scared of getting wet. Unlike dogs, cats don’t really need much time in the bathtub due to their ritualistic grooming routines, but to save the drama for mama, we can help them overcome their fear if we start young. Owners can reassure them that water isn’t necessarily a trauma when they’re still youngsters. Start them out when they’re kittens and try introducing them by rubbing a soothing, warm washcloth other them. Introduce them into temperature-appropriate water temperatures and refrain from dunking them completely until they begin to become accustomed to the wetness. While they may take to a litter box almost immediately, getting them used to being wet is easier when they’re just kittens. 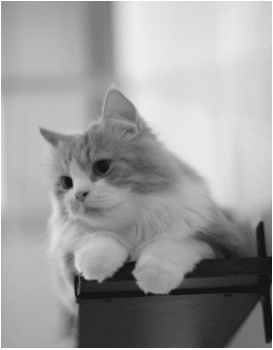 By introducing your cat to water at a younger age, you could help them to be more tolerate in the future. An intriguing discussion is definitely worth comment. I believe that you should publish more about this issue, it might not be a taboo subject but generally people don’t speak about these issues. To the next! All the best! !